Between 1818 and 1820, John Randel, Jr. prepared an atlas of 92 watercolor maps that vividly illustrates the properties, old roads, and major features of pre-grid Manhattan as well as the future location of the new streets and avenues of the 1811 grid. This set of one-of-a-kind documents has long been in the care of the Office of the Manhattan Borough President. 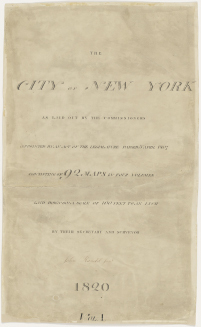 Through an extraordinary public-private collaboration, the Museum of the City of New York and the Office of the Manhattan Borough President worked together to digitize this unique resource and assure its preservation and access to the public. This website offers two ways to examine the maps: the 92 sheets can be viewed individually in the Randel Map Gallery or as an interactive composite map. vol. 3, p. 30, showing 221st to 228th Street, from Spiting Devil Creek to the Haerlem River, February 1, 1819.
vol. 4, p. 27, showing 213th to 221st Street, from Twelfth Avenue to the Hudson River, February 1, 1819.
vol. 3, p. 29, showing 213th to 221st Street, from Twelfth Avenue to the Haerlem River, February 1, 1819.
vol. 4, p. 26, showing 205th to 213th Street, from Twelfth Avenue to the Hudson River, February 1, 1819.
vol. 3, p. 28, showing 205th to 213th Street, from Twelfth Avenue to the Haerlem River, February 1, 1819.
vol. 4, p. 25, showing 197th to 205th Street, from Twelfth Avenue to the Hudson River, February 1, 1819.
vol. 3, p. 27, showing 197th to 205th Street, from Twelfth Avenue to the Haerlem River, February 1, 1819.
vol. 4, p. 24, showing 189th to 197th Street, from Twelfth Avenue to the Hudson River, February 1, 1819.
vol. 3, p. 26, showing 189th to 197th Street, from Twelfth Avenue to the Haerlem River, February 1, 1819.
vol. 4, p. 23, showing 181st to 189th Street, from Twelfth Avenue to the Hudson River, April 10, 1819.
vol. 3, p. 25, showing 181st to 189th Street, from Twelfth Avenue to the Haerlem River, April 10, 1819.
vol. 4, p. 22, showing 173rd to 181st Street, from Twelfth Avenue to the Hudson River, April 10, 1819.
vol. 3, p. 24, showing 173rd to 181st Street, from Twelfth Avenue to the Haerlem River, April 10, 1819.
vol. 4, p. 21, showing 165th to 173rd Street, from Eleventh Avenue to the Hudson River, April 10, 1819.
vol. 3, p. 23, showing 165th to 173rd Street, from Eleventh Avenue to the Haerlem River, April 10, 1819.
vol. 4, p. 20, showing 157th to 165th Street, from Eleventh Avenue to the Hudson River, April 10, 1819.
vol. 3, p. 22, showing 157th to 165th Street, from Eleventh Avenue to the Haerlem River, April 10, 1819.
vol. 4, p. 19, showing 149th to 157th Street, from Ninth Avenue to the Hudson River, April 10, 1819.
vol. 3, p. 21, showing 149th to 157th Street, from Ninth Avenue to the Haerlem River, May 18, 1819.
vol. 4, p. 18, showing 141st to 149th Street, from Ninth Avenue to the Hudson River, May 18, 1819.
vol. 3, p. 20, showing 141st to 149th Street, from Sixth Avenue to Ninth Avenue, May 18, 1819.
vol. 2, p. 18, showing 141st to 149th Street, from Sixth Avenue to the Haerlem River, May 18, 1819.
vol. 4, p. 17, showing 133rd to 141st Street, from Ninth Avenue to the Hudson River, June 15, 1819.
vol. 3, p. 19, showing 133rd to 141st Street, from Sixth Avenue to Ninth Avenue, May 18, 1819.
vol. 2, p. 17, showing 133rd to 141st Street, from Sixth Avenue to the Haerlem River, May 18, 1819.
vol. 4, p. 16, showing 125th to 133rd Street, from Ninth Avenue to the Hudson River, June 15, 1819.
vol. 3, p. 18, showing 125th to 133rd Street, from Sixth Avenue to Ninth Avenue, May 18, 1819.
vol. 2, p. 16, showing 125th to 133rd Street, from Third Avenue to Sixth Avenue, May 18, 1819.
vol. 1, p. 19, showing 125th to 129th Street, from Third Avenue to the Haerlem River, May 18, 1819.
vol. 4, p. 15, showing 117th to 125th Street, from Ninth Avenue to the Hudson River, June 15, 1819.
vol. 3, p. 17, showing 117th to 125th Street, from Sixth Avenue to Ninth Avenue, July 24, 1820.
vol. 2, p. 15, showing 117th to 125th Street, from Third Avenue to Sixth Avenue, July 8, 1820.
vol. 1, p. 18, showing 117th to 125th Street, from Third Avenue to the East River, July 8, 1820.
vol. 4, p. 14, showing 109th to 117th Street, from Ninth Avenue to the Hudson River, June 15, 1819.
vol. 3, p. 16, showing 109th to 117th Street, from Sixth Avenue to Ninth Avenue, June 15, 1819.
vol. 2, p. 14, showing 109th to 117th Street, from Third Avenue to Sixth Avenue, July 24, 1820.
vol. 1, p. 17, showing 109th to 117th Street, from Third Avenue to the Haerlem River, July 24, 1820.
vol. 4, p. 13, showing 101st to 109th Street, from Ninth Avenue to the Hudson River, June 15, 1819.
vol. 3, p. 15, showing 101st to 109th Street, from Sixth Avenue to Ninth Avenue, June 15, 1819.
vol. 2, p. 13, showing 101st to 109th Street, from Third Avenue to Sixth Avenue, July 24, 1820.
vol. 1, p. 16, showing 101st to 109th Street, from Third Avenue to the Haerlem River, July 21, 1820.
vol. 4, p. 12, showing 93rd to 101st Street, from Ninth Avenue to the Hudson River, June 15, 1819.
vol. 3, p. 14, showing 93rd to 101st Street, from Sixth Avenue to Ninth Avenue, June 15, 1819.
vol. 2, p. 12, showing 93rd to 101st Street, from Third Avenue to Sixth Avenue, July 24, 1820.
vol. 1, p. 15, showing 93rd to 101st Street, from Third Avenue to the East River, July 24, 1820.
vol. 4, p. 11, showing 85th to 93rd Street, from Ninth Avenue to the Hudson River, September 1, 1820.
vol. 3, p. 13, showing 85th to 93rd Street, from Sixth Avenue to Ninth Avenue, September 1, 1820.
vol. 2, p. 11, showing 85th to 93rd Street, from Third Avenue to Sixth Avenue, July 8, 1820.
vol. 1, p. 14, showing 85th to 93rd Street, from Third Avenue to the East River, 1820.
vol. 4, p. 10, showing 77th to 85th Street, from Ninth Avenue to the Hudson River, September 1, 1820.
vol. 3, p. 12, showing 77th to 85th Street, from Sixth Avenue to Ninth Avenue, September 1, 1820.
vol. 2, p. 10, showing 77th to 85th Street, from Third Avenue to Sixth Avenue, July 24, 1820.
vol. 1, p. 13, showing 77th to 85th Street, from Third Avenue to the East River, July 24, 1820.
vol. 4, p. 9, showing 69th to 77th Street, from Ninth Avenue to the Hudson River, September 1, 1820.
vol. 3, p. 11, showing 69th to 77th Street, from Sixth Avenue to Ninth Avenue, September 1, 1820.
vol. 2, p. 9, showing 69th to 77th Street, from Third Avenue to Sixth Avenue, July 24, 1820.
vol. 1, p. 12, showing 69th to 77th Street, from Third Avenue to the East River, July 24, 1820.
vol. 4, p. 8, showing 61st to 69th Street, from Ninth Avenue to the Hudson River, September 1, 1820.
vol. 3, p. 10, showing 61st to 69th Street, from Sixth Avenue to Ninth Avenue, September 1, 1820.
vol. 2, p. 8, showing 61st to 69th Street, from Third Avenue to Sixth Avenue, July 24, 1820.
vol. 1, p. 11, showing 61st to 69th Street, from Third Avenue to the East River, July 24, 1820.
vol. 4, p. 7, showing 53rd to 61st Street, from Ninth Avenue to the Hudson River, September 1, 1820.
vol. 3, p. 9, showing 53rd to 61st Street, from Sixth Avenue to Ninth Avenue, September 1, 1820.
vol. 2, p. 7, showing 53rd to 61st Street, from Third Avenue to Sixth Avenue, September 1, 1820.
vol. 1, p. 10, showing 53rd to 61st Street, from Third Avenue to the East River, July 24, 1820.
vol. 4, p. 6, showing 45th to 53rd Street, from Ninth Avenue to the Hudson River, September 20, 1819.
vol. 3, showing 45th to 53rd Street, from Sixth Avenue to Ninth Avenue, September 20, 1819.
vol. 2, p. 6, showing 45th to 53rd Street, from Third Avenue to Sixth Avenue, September 20, 1819.
vol. 1, p. 9, showing 45th to 53rd Street, from Third Avenue to the East River, September 20, 1820.
vol. 4, p. 5, showing 37th to 45th Street, from Ninth Avenue to the Hudson River, December 1, 1819.
vol. 3, p. 5, showing 37th to 45th Street, from Sixth Avenue to Ninth Avenue, September 20, 1819.
vol. 2, p. 5, showing 37th to 45th Street, from Third Avenue to Sixth Avenue, September 20, 1819.
vol. 1, p. 8, showing 37th to 45th Street, from Third Avenue to the East River, September 20, 1819.
vol. 4, p. 4, showing 29th to 37th Street, from Ninth Avenue to the Hudson River, September 20, 1819.
vol. 3, p. 4, showing 29th to 37th Street, from Sixth Avenue to Ninth Avenue, September 20, 1819.
vol. 2, p. 4, showing 29th to 37th Street, from Third Avenue to Sixth Avenue, 1819.
vol. 1, p. 7, showing 29th to 37th Street, from Third Avenue to the East River, December 1, 1819.
vol. 4, p. 3, showing 21st to 29th Street, from Ninth Avenue to the Hudson River, July 23, 1819.
vol. 3, p. 3, showing 21st to 29th Street, from Sixth Avenue to Ninth Avenue, December 1, 1819.
vol. 1, p. 6, showing 21st to 29th Street, from Third Avenue to the East River, December 1, 1819.
vol. 4, p. 2, showing 13th to 21st Street, from Ninth Avenue to the Hudson River, July 23, 1819.
vol. 3, p. 2, showing 13th to 21st Street, from Sixth Avenue to Ninth Avenue, July 23, 1819.
vol. 2, p. 2, showing 13th to 21st Street, from Third Avenue to Sixth Avenue, 1819.
vol. 1, p. 5, showing 13th to 21st Street, from Third Avenue to the East River, December 1, 1819.
vol. 4, p. 1, showing Greenwich Lane to 15th Street, from Eighth Avenue to the Hudson River, July 23, 1819.
vol. 3, p.1, showing Greenwich Lane to 13th Street, from Sixth Avenue to Ninth Avenue, July 23, 1819.
vol. 2, p. 1, showing Greenwich Lane to 13th Street, from Third Avenue to Sixth Avenue, December 1, 1819.
vol. 1, p. 3, showing 6th to 13th Street, from Third Avenue to Avenue B, July 23, 1819.
vol. 1, p. 4, showing 6th to 13th Street, from Avenue B to the East River, July 23, 1819.
vol. 1, p. 2, showing North Street to 6th Street, from Avenue B to the East River, July 23, 1819.